The Fifth International Equine Conference on Laminitis and Diseases of the Foot is pleased to announce featured presentations by the top veterinarians and farriers from around the world. This year’s conference will be held November 6-8, 2009, at the Palm Beach County Convention Center in West Palm Beach, FL. James A. Orsini, DVM, DACVS, is the Director of The Laminitis Conference and has helped bring together the world’s experts and visionaries on laminitis to create an innovative, educational, and entertaining program for conference attendees. The goals of the Fifth International Equine Conference on Laminitis and Diseases of the Foot are the better understanding, prevention, and treatment of laminitis and other diseases of the equine foot. The format includes scientific and practical tracks with topical sessions followed by small group practical workshops providing information that attendees can incorporate into their daily routines. Dr. Orsini is a faculty member at the University of Pennsylvania and Associate Professor of Surgery in the School of Veterinary Medicine. He will begin the conference by leading a moderated discussion with James Kennedy Belknap, DVM, DACVS, and Rustin Moore, DVM, PhD, DACVS of the Ohio State University. In addition to the moderated discussion, Dr. Orsini will be lecturing during the first day’s Practical Session on Regional Perfusion and on the final day of the conference he will he leading a small group workshop about Laminitis Pain Management with Amy Rucker, DVM. This year’s international speakers will include Drs. Christopher C. Pollitt and Andrew van Eps of the University of Queensland (AUS). Dr. Pollitt will conduct two scientific sessions, the first on Laminitis Research, and the second on Glucose and Laminar Fuels. He will also be in charge of the entire practical session for the second afternoon, entitled “Lessons Learned from Wild Horse Hooves in Australia’s Outback.” The afternoon will be broken down into two sessions: “Part 1: What Does This Mean for Domestic Hoof Care?” and “Part 2: The Inner Hoof, Wild and Domestic.” During the final day Dr. Pollitt will conclude with a small group workshop about Prevention and Management of Contralateral Limb Laminitis with Dr. Scott Morrison. The Fifth International Equine Conference on Laminitis and Disease of the Foot will bring together the world’s top veterinarians, farriers, and research scientists to help educate the public and further the fight against laminitis. 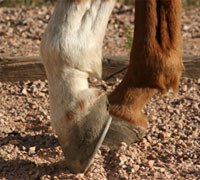 I hope that someday soon there will be a cure for laminitis. It’s good to hear how hard people are working on curing laminitis!